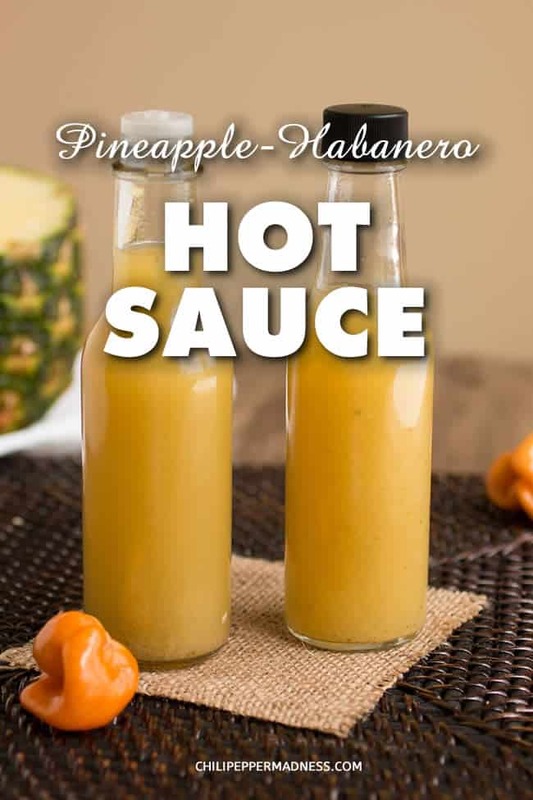 Make your own hot sauce at home with this quick and easy recipe that incorporates spicy habanero peppers, sweet pineapple and cilantro. Perfect for dashing over meals or spicing up your favorite cocktails. We like it for our Bloody Marys. This hot sauce exists for 2 very specific reasons. FIRST, the habanero peppers are POPPING in the garden. We seriously LOVE when the garden starts producing. So many fresh peppers! We can walk right outside and grab a few off the plants and get busy! Talk about living. SECOND…Bloody Mary. If you are like us, you enjoy a bit of spice and kick to your Bloody Mary drinks, and this, my friends, is the solution. 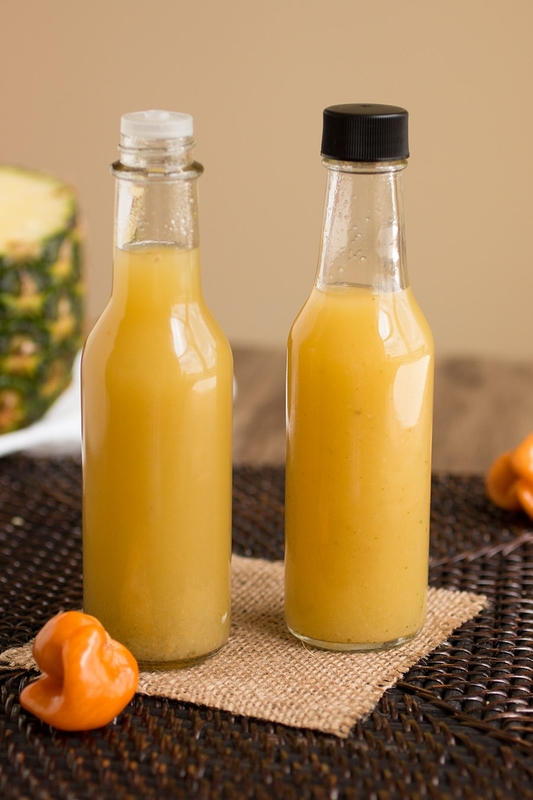 Pineapple-Habanero Hot Sauce. To be honest, it’s great on just about anything that can take the level of heat with the touch of sweet. It’s on the vinegary side, which works for me for many things. Think Tabasco sauce. It’s about that consistency level, thin and “dashy”. Dash it over chicken tacos or a fish fillet, over pork shoulder or sliced pork loin or pretty much any pork. Dash it onto your veggies. Or hey, into your Bloody Mary! You don’t need many ingredients for this one. 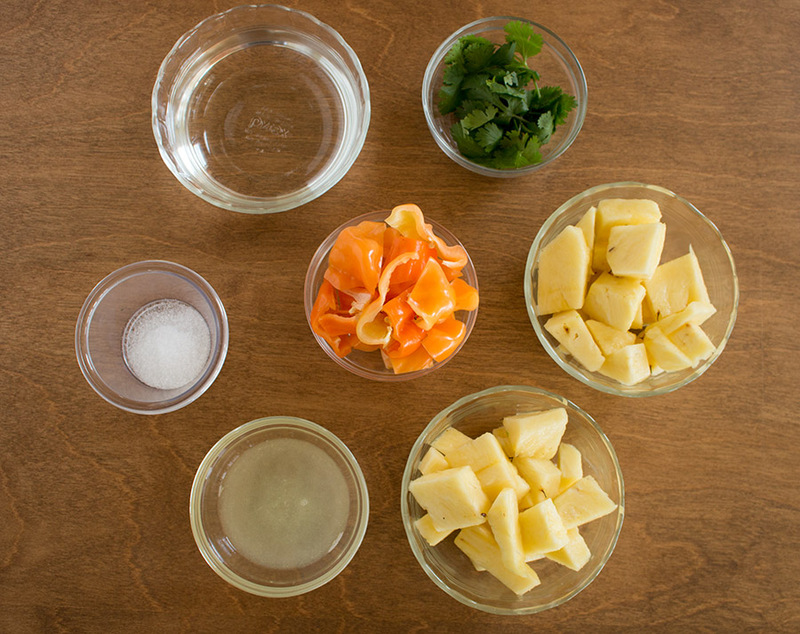 The list includes: Habanero peppers, pineapple, cilantro, lime juice, white vinegar and salt. Easy, right? It is thinner because you’ll strain this one at the very end. However! If you prefer a thicker hot sauce, you have a couple of options. FIRST, just don’t strain it. I don’t like to keep this one completely unstrained because the ingredients chosen easily separate in the bottle. No biggie, though, as you can simply shake up the bottle before each use. Or, SECOND, add a bit of the strained pulp back into the sauce before you bottle it. That’s what I did here. I took about a tablespoon of the pulp and swirled it back into the finished sauce, just for a bit of substance. I like the little swirlies you get in the bottle. It’s a vibrant and flavorful hot sauce recipe, ready and willing to go where your taste buds want to take you. It takes practically no time to make, which is nice. I posted a VIDEO RECIPE below so you can see just how easy it really is. Making hot sauce at home is fun, isn’t it? All you need are a few ingredients. I hope you enjoy it! Mike mentioned using this in your Bloody Mary, but give a dash into your beer. Seriously! I love it. Also, it was FUN making the video. I hope we do more of them! Cool and strain, if desired. If you want a chunkier hot sauce, skip the straining. Or, strain and add a bit of the pulp back in to your desired consistency. Very nice recipe. I live near Saint Augustine FL and have an extremely high yield Datil pepper plant in my garden, so I used datils instead of habaneros (similar in hotness but sweet as well). Also used canned pineapples with the juice included, and added a large sweet onion (I tripled the recipe) and it turned out wonderfully. I’m always appreciative of simple recipes like yours. One question: I’ve seen a number of hot sauce recipes that call for much longer Cook time. Did you do the shorter cooking time for a reason? Do you think it would work just as well if I simmer it for two-three hours? Thanks again! Colin, thank you for your comment. I appreciate it. You can cook/simmer the ingredients longer if you’d like and the flavors will develop along that way, like any sauce. I find a shorter cook time is fine, though, to get them to meld, and the flavors continue to mingle and develop in the bottle. Very good recipe and easy to make! After straining the sauce, I added about half of the pulp back in to thicken it up and it was just the way I like it! Several friends tried the sauce and loved it also. I like sauces with different heat levels so I am going to try a batch using maybe 2 peppers. Thanks so much for sharing! So far so good! The color was a little greener than this photo but that’s not a problem for me. It’s smelling wonderful! I wonder will this work with ghost peppers as well? Thanks, Jennifer. Absolutely, make this with ghosts! Let me know how it turns out for you! So yummy!! I’ll definitely make this again!! That’s great, Nicole! Thanks! Glad you enjoyed it. This is so freaking good it’s not even funny. I roasted the Habeneros and then just threw everything together on the stove and used an immersion blender. Rudicously good! Bravo! I’m so thankful I found your website, no more wasting peppers from the tiny garden! That’s GREAT, Bill! Yes, waste no peppers! I love it. I made a double batch of this used 4 limes instead 2 and I used pineapple and mango and I did 20 peppers half I left the them just cut off the tops other half took out most of the seeds and vein and I also reblended it after I let it cool to make it smoother so need to strain can’t wait to try it. I wish I could a picture of the bottles. if i wanted to make it hotter how many peppers would you suggest if i didnt want to remove the seeds and vein of the peppers. Thomas, you could realistically double or triple the amount of habaneros in the recipe. It will just get thicker. You can thin it out a bit with a bit more vinegar to your own textural preference. Also, if you really want to heat it up, toss in something like a ghost pepper or 7 Pot pepper. Nice! Let me know how it turns out for you. Well I’m limited right now on what peppers I can get. I can easily get habaneros and I was was thinking of still using the 6 peppers and seed and de vein half of them and the other half keep them whole and just remove the stems. That should work GREAT, Thomas. Enjoy! I used white wine vinegar as this is the type vinegar I use in my Mango Habanero and Raspberry Habanero jelly. Excellent, Edee! Glad you enjoyed it. KO, if you’re not crazy about the vinegar flavor of this sauce, you can make it with only half the vinegar, and don’t strain it. Leave it thicker. You could actually replace vinegar with water, but it won’t keep for long. If you do this, use it within a week or so. It will still taste great. Thanks Mike, I can’t believe I just found your website. I’ve been growing Scotch Bonnets since I saw Bobby Flay Throwdown vs Ripe Restaurant. Couldn’t get them locally so I ordered seeds and grew them to replicate the Jerk Ribeye on that show. Yep, ACV is usually a good substitute. I like it! I haven’t made this yet but in general how do you know if hot sauce in still good, what signs do you look for? REPLY: Bill, if you see any signs of fuzzy growth on the top, or any weird fizzing in the closed bottle, it’s probably bad in some way. Sometimes the crusting at the top can foment growth, so be sure to keep the top of the bottle clean. A hot sauce with high vinegar content will last years in general, though. — Mike from Chili Pepper Madness. REPLY: Bryan, mango would be great here! — Mike from Chili Pepper Madness. I made this recipe but it lost it’s heat the next day. Right after I made it, the taste was great – a lot of heat with the flavor of pineapple- really delish. I put in in my glass sanitized hot sauce bottle and put in the fridge. The next morning it lost almost all of it’s heat. I was so bummed. Do you know why that may have happened? REPLY: Jacque, sauces do tend to mellow, though it is odd after only a day. It is possible the fridge cooling made a difference, though it’s probably just a blending of the overall ingredients. — Mike from Chili Pepper Madness. REPLY: Sandybluetoes, no, you can omit, or replace with an ingredient you prefer. — Mike from Chili Pepper Madness. Can you use pineapple juice instead of pineapple chunks, since you have to blenderize anyway? REPLY: Janet, it will work but you won’t have quite as much substance in the final sauce. Let me know how it turns out for you. — Mike from Chili Pepper Madness. Awesome! Yeah, those fumes can get ya! So good! Added some garlic which was a delicious addition. Glad to have a recipe that will help me use up my habaneros! Thanks for the great recipe! REPLY: Ron, yes, you can, though it won’t last as long. I prefer to store it in the refrigerator. — Mike from Chili Pepper Madness. Can you can it in jars like salsa? REPLY: Ann, yes, you can, as long as you follow proper canning procedures. Let me know how it turns out. — Mike from Chili Pepper Madness. Thank you, Mikael! Super happy you liked it. Great sauce and a flexible one as well. I didn’t have white vinegar and lime so I used apple vinegar and lemon and it became very nice nevertheless. I think this sauce is a great start for experiments as well. Thanks for sharing it! Of course! Super happy you enjoyed it. REPLY: Thuli, I suggest checking with restaurant supply stores for storage containers. If the sauce is properly acidic, it will last a while in the refrigerator. Just keep a lid on it. — Mike from Chili Pepper Madness. I have a scotch bonnet plant that is loaded with fruit and a pineapple about half way through growing that I am growing just for this recipe, I do not have any jalapeno’s though, could I use Ankor sunrise or Dragon thai chili instead? They are both very robust little peppers but not I am not sure how well they would mate with the S.B. What would you suggest? Use just the S.B. or add one of the others? REPLY: Edward, I think you can make this with Thai chilies. I think the combination would be wonderful, actually. Let me know how it turns out for you. — Mike from Chili Pepper Madness. I don’t have a food processor what else could I use to make it? REPLY: Keeli, try a blender instead. — Mike from Chili Pepper Madness. I’m going to have some Carolina Reapers this summer, and I’m looking for a sweeter sauce recipe for them. Do you think it would be problematic to substitute the habaneros with the Reapers? REPLY: Dan, not at all. Give it a try and let me know how it turns out for you. — Mike from Chili Pepper Madness. I love this sauce! Last time I left it chunky and we were using it as a dip with tortilla chips, sweet chili Doritos and salt and vinegar chips! 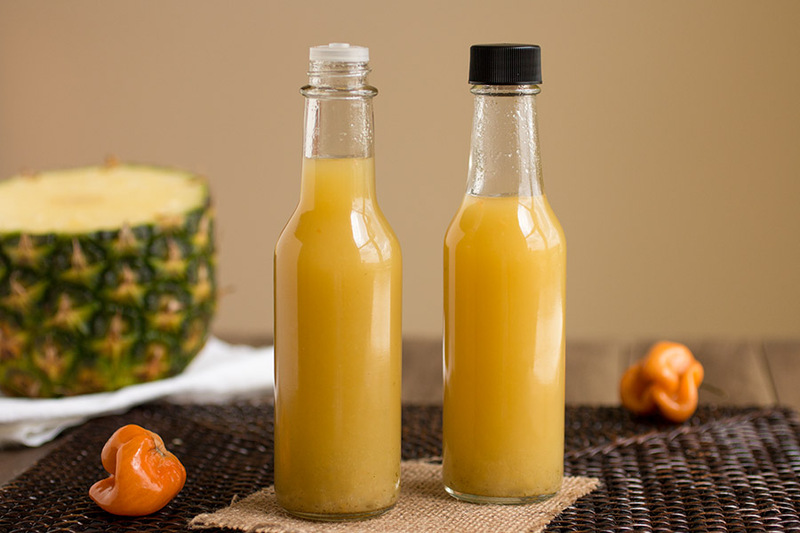 Besides using it on rice and other stuff lol I am making another batch today and this time I am using a fresh pineapple to see the difference. I only have the chocolate habeneros. Will these be ok to use and how many would I use. They are much hotter than the traditional orange habeneros. REPLY: Marcia, yes, you can sub in chocolate habaneros. The flavor and color will be different, but it will still be good. You also use half the amount of chocolate habaneros and use other milder peppers to about the same weight for more body to the sauce. — Mike from Chili Pepper Madness. Can you use other fruits besides pineapple? REPLY: Matt, absolutely. Look at some of the other hot sauce recipes in our Hot Sauces section of the site. I’ve made several with other fruits. — Mike from Chili Pepper Madness. Made this one yesterday. I have used canned pineappled, fresh parsley instead cilantro, but added 1/2 teaspoon of ground coriander/cilantro seeds. Also, replaced part of white vinegar with homemade red wine vinegar.. I didn’t strain the sauce but blend until very smooth. Overall, very nice sweet, hot and acidic sauce. Next time I’ll try to replace most of the white vinegar with milder one. Great, thanks for checking it out! Can I use can pineapple or do you think it would make a big difference in the end results? REPLY: Dawn, yes, you can use canned pineapple in this. No problem! — Mike from Chili Pepper Madness. My habernero’s are not ready can I use jalapeño instead?? REPLY: Janice, yes, you can use jalapenos. The flavor won’t be the same, but it should taste rather nice. Jalapenos would be a nice sub. — Mike from Chili Pepper Madness. Why do you cook it before bottling?